kLink is a Customizable Online Server for the IBM i. It can be configured to do many things including: Document distribution, secure file transfers (upload and download), and receive submitted Interactive PDF Forms data. kLink also includes programmable buttons for performing many other custom business processes. kLink uses two HTTP Servers to transfer documents to and from any browser or mobile device, including iPads, iPhones, and Android devices. One kLink server is for your employees (those with User-ID's) and the other kLink server is for your customers or agents (those without User-ID's). You can click the kLink Icon (below) to connect to our kLink server. You can login as a guest to try out some of the features. kLink has built in security to prevent hacking and to allow easy transfers of private content to and from the appropriate authorized end user. For Employees, kLink adheres to standard IBM resource security for the IFS. For all users, kLink will only access the directories that you specifically configure for them to use. kLink uses its own built in security to share public and private content only to the correct users. The users will only be shown and have access to the appropriate directories in the IFS. Any Public directories that you define in the kLink System Setup will be presented to the User. Links are made for each of the User Accounts. A Link is the name of a Private Directory in the IFS that contains a user's private content. 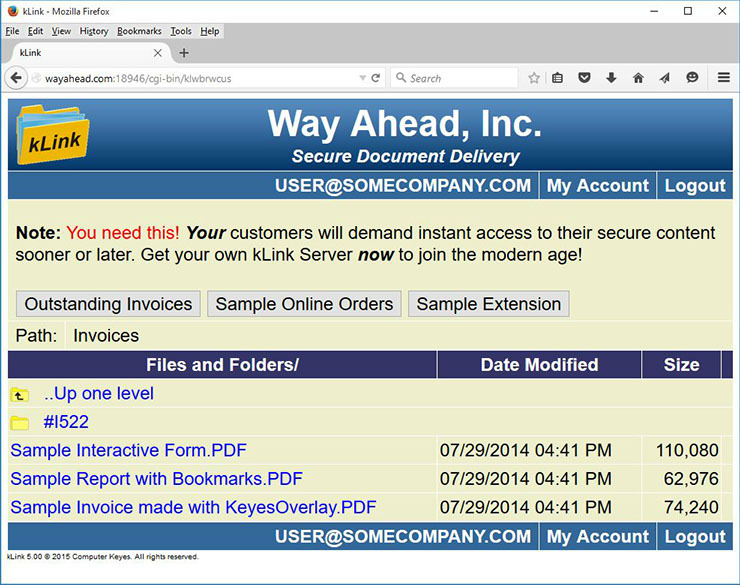 As an example, the Invoices Directory (shown below) contains lots of Private Directories. This particular user has I522 (which is their customer number) added as a Link to their account, therefore that directory is the only one presented. To simplify and speed the registration process, you can set up kLink to allow online registration. New users are led through a series of validation and security questions so that they can be automatically authenticated. With online registration, users can add private Links to their accounts only after the server's validation program verifies their answers. The kLink accounts can also be maintained by an administrator within your company. 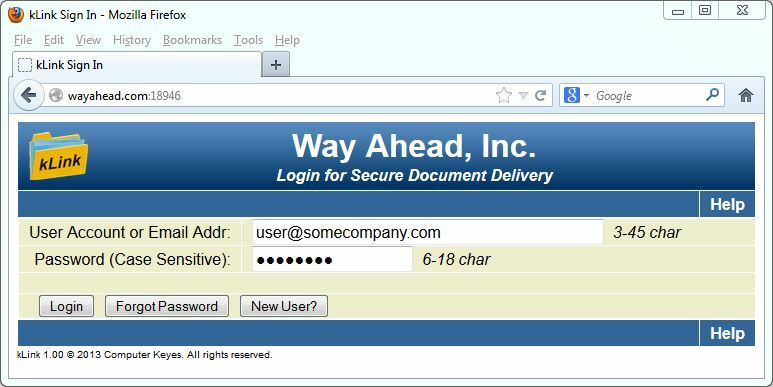 A second kLink server may be used by your own employees, who sign in using their normal User Profile and Password. It will deliver content that the IBM resource security allows for their user profile, within the IFS directory path that you define in kLink. kLink Extensions are programmable buttons that provide automated mobile communications between a company and its users (employees, customers, agents). Each Extension that is configured will add a button to the top of the user's screen while browsing with kLink. In the example below three Extensions have been added titled: Outstanding Invoices, Sample Online Orders, and Sample Extension. Extensions are configured by defining input and output objects to appear on the user's screen. The user fills out or selects items from the screen before submitting it. Prefill programs and Exit programs are used to prefill screens and process the input data coming from your users. The programs return messages back to the user, as it monitors their progress. Any external process can be called for or triggered by the Prefill and Exit programs to prefill and validate the users input, save the input data, process an order, or to perform any desired process. You will define up to 3 different validation questions to be asked of new users to authenticate them. A customized program is used by kLink to verify the answers to your questions, by checking the answers against data found in your own master files. This program will only allow the appropriate users to register new accounts and to add Links to their accounts. 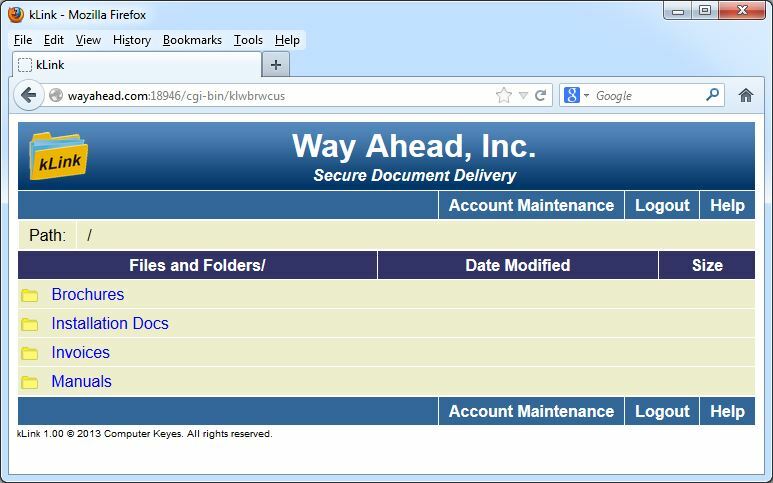 KeyesPDF, KeyesMail, and KeyesArchive all have the capability to automatically burst spooled files, generate PDF documents for each part and store the results in the appropriate private directories in the IFS. Files can also be placed manually onto the IFS for distribution. To try kLink free for 30 days, use the link below to download the software to a PC and then double click to extract a Readme.txt with further instructions. Contact us or use the form below to have an activation code sent to your email. kLink Mobile can be found in the Apple App Store HERE. 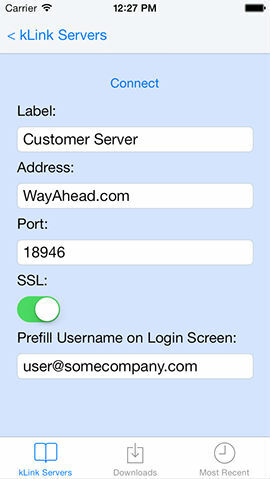 kLink Mobile is a free application that can connect users to your kLink server. It allows mobile users on Apple iPhones and iPads quick access to servers they have been grated access to, allowing them to download (and upload, if uploads have been turned on) any file to your kLink server. kLink Mobile provides a file system on the user's device where any file, regardless of whether or not the device can open it, can be stored. Saved files of types that can be opened by the device or by other applications within the device can then be accessed and used at any time, even when offline. kLink Mobile integrates with your device to allow you to save files to the app's file system from email or text message, as well as send files into your file system from those and other locations as well. A new type of input field has been added to the kLink Extensions. A Date field will allow a user to select a date from a calendar. As of this writing, this new input field type is supported by Chrome, Opera and iOS. Other browsers will hopefully add this support some time in the near future. 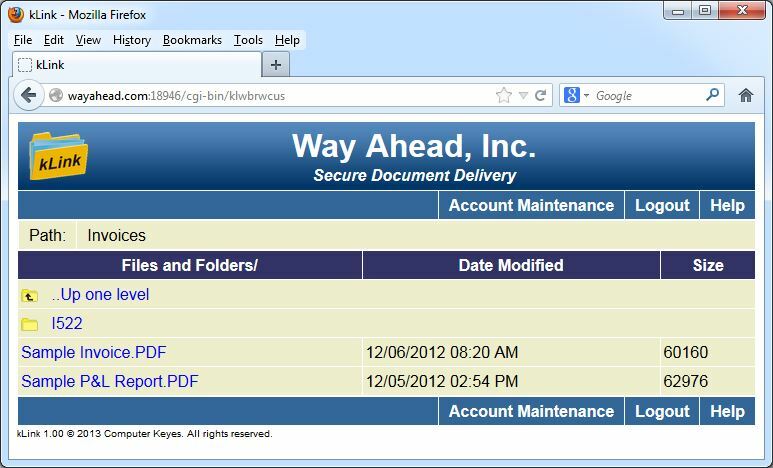 The full IFS Path will be shown on the kLink Browser screen for the Employee Server. Screen Codes can be used to create a series of screens for an Extension. You may code as many screens as you wish, by specifying a one or two character Screen Code for each of the additional Extension screens. A new field called Next Screen is used to specify which screen, in the series, to display next. You can set the Next Screen code as you define each screen and can change the Next Screen programmatically, using Exit Programs. You can create Prefill Exit programs for your Extension screens. This will allow you to programmatically set Default values for Input fields or change entire Object Lines to different values. New Object Types can be defined for your Extension screens. Buttons can be used to define your own processing buttons on the screen. Files can be used to display multiple columns of data across the screen. Graphics can be used to display images on the Extension screens. 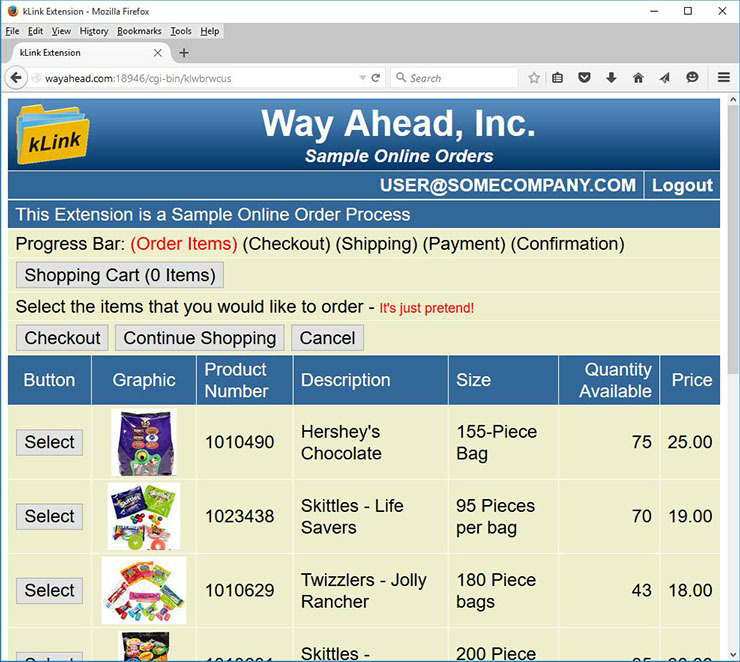 With these new object types it is easy to generate any type of Order Processing screens with kLink. 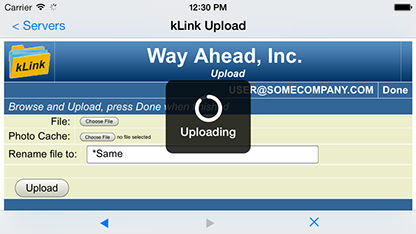 The maximum size of Uploaded files, through the kLink server, has been increased. The previous maximum size was 16Mb. Now, you can upload files much larger. The new maximum size of uploaded files will be the size that you set in the Employee or Customer Server setup, in the "Max Uploads" parameters. Source code for an Exit Program that can be used to edit PDF Forms data, has been added. The program will perform a live edit of the PDF Forms data as it is submitted by a user. If the data is rejected, it will not be recorded. The user will be able to correct the Form and resubmit the data to the kLink Server. 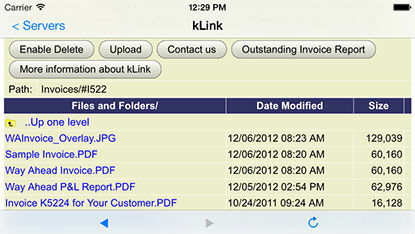 The kLink server will accept submitted Interactive PDF Forms data from your users. The data will be placed in a Source file that allows for easy processing on the IBM i. An .FDF file is also saved in your IFS. This allows you to open the original PDF with all of the Interactive fields filled out - just as the user had submitted the Form data. The Upload feature has been moved from Extensions and placed in the base system. This will make Uploading data much easier to implement and control. The Upload capability can be turned ON or OFF for individual Employees and Customers. The ability to delete files from the IFS has been added. Each of the two servers (Employee and Customer) can have this function enabled or disabled in the kLink Setup. If Enabled, Employees or Customers will only be able to delete files that are within a directory that they have been given access to. The Delete capability can be turned ON or OFF for individual Employees. A Log file has been added to Log file viewing and file upload activity for the Employee server. More options have been added that will allow a company to set different Root Directories for each Employee to access the IFS. All of the fonts that the kLink server sends to browsers and mobile devices have been enlarged. This was done to make the display on small mobile devices easier to read. A new Object Type has been added to kLink Extensions. The new Object type allows you to add the ability for a user to upload files to the IFS. Add two purge programs that crawl through the IFS removing old files from Customer or Employee directories. These purge programs can be used to clean up the IFS directories used to disseminate documents through kLink. Add the ability to sort the IFS files by Date or by Name. Each user may select either sort order. Date order will put the newest entries first. kLink Extensions are used to provide automated mobile communications between a company and its users (employees, customers, agents). Each Extension that is configured will add a button to the top of the user's screen while browsing with kLink. Extensions can be used to create an on demand system for delivering documents and data or they can be used to get additional information from users. You may code ¬H within the Root or Default Path for the Employee Server. 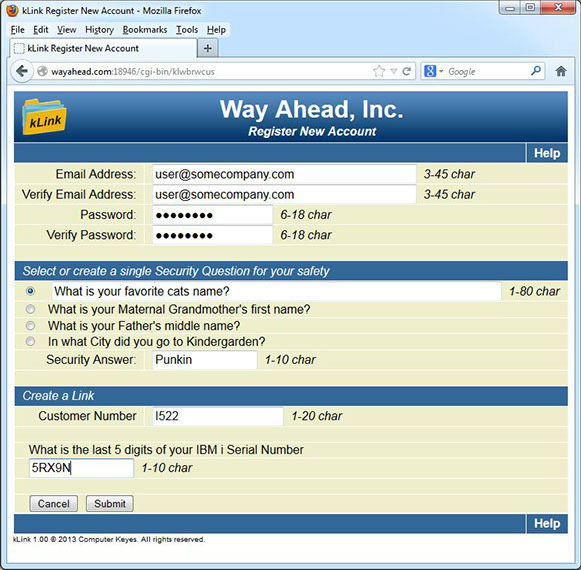 This will be replaced with the Home Directory as it is recorded in the employee's user profile as they sign onto the kLink Employee Server. For example, if you coded "¬H" in the Path - kLink will start the employee in their own Home directory. The Employee server does allow the setup to select the Root directory in the IFS for display. QSYS is accessible from the Root directory. We have altered the Employee server so that it will not display or work with the QSYS directory from the IFS. You may code ¬U within the Root or Default Path for the Employee Server. This will be replaced with the User-ID of the employee that signs onto the kLink Employee Server. For example, if you coded "/Home/¬U" in the Path - kLink will start the employee in their own directory within the Home directory.